ca. 365 - 355 B.C. Detail of Aphrodite from a painting depicting a mortal couple--either Paris and Helen or Amphiaraus and Eriphyle-- observed by the gods. Aphrodite sits in the sky beside the god Apollo (not shown), observing a pair of lovers. She wears a long robe, slippers, veil, necklace and bracelets and her wavy hair is tied back in a ponytail. 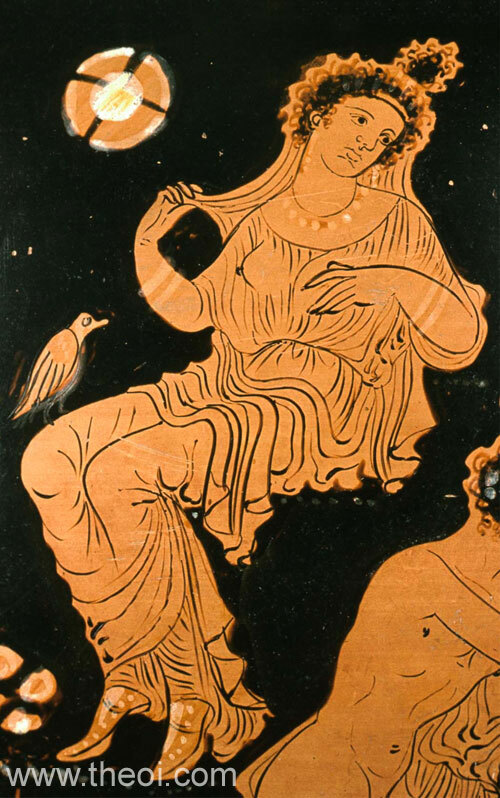 A bird--probably a dove, the goddess' usual animal familiar--sits on her lap.